Below is a list of confirmed public concert dates for 2016. See also private events. Saturday, January 23, 6 PM, Ancient Future with Matthew Montfort (scalloped fretboard guitar), Vishal Nagar (tabla), Mariah Parker (santur), and special guest Georges Lammam (Arabic violin), The Mazza Castle, 900 Mirador Terrace, Pacifica, CA 94044. $40 per guest, includes wine and refreshments. Limited to 45 seats. Reserve tickets early at Brown Paper Tickets. 6 PM - Gather with refreshments. Music begins promptly at 7 PM. Info: 650-355-0272. Press Release. Facebook Event. Sunday, January 24, 6:30 to 9 PM, Ancient Future Dinner Concert with Matthew Montfort (scalloped fretboard guitar), Vishal Nagar (tabla), Mariah Parker (santur), and special guests Jason Everett (7 string fretless bass) and Mindia Devi Klein (bansuir flute), Fenix, 919 Fourth Street, San Rafael, CA 94901. Adm: $20 adv./$25 door plus dinner. Tix: Advance tickets highly recommended at www.fenixlive.com/dining/reservations/ and in person at Fenix. Info: 415-813-5600. Press Release. Facebook Event. 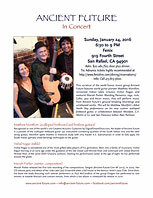 Saturday, March 5, 3 PM, Meeting of Acoustic Minds acoustic Guitar concert featuring Indian-influenced scalloped fretboard guitarist Matthew Montfort, contemporary fingerstyle and Celtic guitar wizard Teja Gerken, and coastal-inspired slide and fingerstyle guitarist Mark Kostrzewa, J7 Studios, 850 Airport St #10, Moss Beach, CA 94038. Tix: $15 at the door for adults, teens $7.50 and under 10 free. Beer and wine available during the show. Facebook Event. Sunday April 3, 2016, 7 PM, Ancient Future Guitar and Tabla Duet with Matthew Montfort (scalloped fretboard guitar) and Vishal Nagar (tabla), Willits Community Theatre, 37 West Van Lane. Willits, CA 95490. Tix: $15. Available in person at Mazahar at 38 S. Main St., online at brownpapertickets.com, by phone at 800-838-3006, and at the door the night of the show if seats are still available. Press Release. Facebook Event. Poster. Saturday, April 9, 2016, 8 PM, Ancient Future with Matthew Montfort (scalloped fretboard guitar), Vishal Nagar (tabla), and Mariah Parker (santur), Occidental Center for the Arts, 3850 Doris Murphy Ct. (Bohemian Hwy. at Graton Rd. ), Occidental CA 95465. Adm: $22 advance/$25 door. Reserve tickets early at brownpapertickets.com. Info: 707-874-9392. Press Release. Facebook Event. Poster. Saturday, April 30, 8 PM, Mariah Parker's Indo Latin Jazz Ensemble with Mariah Parker (composer, piano, santur), Paul McCandless (Grammy award-winning woodwind virtuoso), Matthew Montfort (scalloped fretboard guitar), Ian Dogole (global percussion), Brian Rice (Latin percussion), Kash Killion (bass, cello), and special guest Michaelle Goerlitz (Latin percussion), Throckmorton Theatre, 142 Throckmorton Ave, Mill Valley, CA 94941. $20 general, $25 day of show, $30 reserved. Advance tix at Throckmorton Theatre. Saturday, May 21, 4:15 PM, Ancient Future with Matthew Montfort (scalloped fretboard guitar) and Vishal Nagar (tabla), Himalayan Fair, Live Oak Park, 1300 Shattuck Ave., North Berkeley, CA 94709. 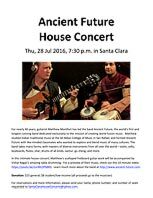 Thursday, July 28, 7:30 PM, Ancient Future with Matthew Montfort (scalloped fretboard guitar) and Vishal Nagar (tabla), House Concert, Santa Clara, CA. Adm: $15 general, $8 student/low-income requested donation. For reservations send your name, phone number, and number of seats requested to SantaClaraHouseConcertsXX@XXyahoo.com (remove the X's). Facebook Event. Meetup Event. Poster. 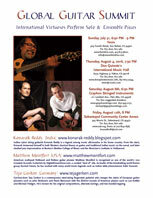 Sunday, July 31, 6:30 PM - 9 PM, Global Guitar Summit with Indian nylon string guitarist Konarak Reddy, American scalloped fretboard and fretless guitar pioneer Matthew Montfort, and German fingerstyle guitarist Teja Gerken, Fenix, 919 Fourth Street, San Rafael, CA 94901.Tix: $12 advance, $15 door. For advance tix and reservations, visit www.fenixlive.com/dining/reservations, call 415-813-5600 or email info@www.fenixlive.com. Press Release. Poster. Facebook Event. Meetup Event. Thursday, August 4, 2016, 7:30 PM, Global Guitar Summit with Indian nylon string guitarist Konarak Reddy, American scalloped fretboard and fretless guitar pioneer Matthew Montfort, and German fingerstyle guitarist Teja Gerken, Don Quixote's International Music Hall, 6275 Highway 9, Felton, CA 95018. Tix: $12 advance, $15 door. Info: Call 831-603-2294 or email tmm@cruzio.com. Press Release. Poster. Facebook Event. Meetup Event. Saturday, August 6th, 6:30 PM, Global Guitar Summit with Indian nylon string guitarist Konarak Reddy, American scalloped fretboard and fretless guitar pioneer Matthew Montfort, and German fingerstyle guitarist Teja Gerken, Gryphon Stringed Instruments, 211 Lambert Ave., Palo Alto, CA 94306. Tix: $20 suggested donation. Info: Call 650-493-2131 or email michael@gryphonstrings.com. Press Release. Poster. Facebook Event. Meetup Event. Friday, August 12th, 8 PM, Global Guitar Summit with Indian nylon string guitarist Konarak Reddy, American scalloped fretboard and fretless guitar pioneer Matthew Montfort, and German fingerstyle guitarist Teja Gerken, Sebastopol Community Center Annex, 425 Morris St., Sebastopol, CA 95472. Tix: $20 advance, $23 door. For advance tix and reservations, call Kevin at 707-824-1858 or email krussellmft@aol.com. Press Release. Poster. Facebook Event. Meetup Event. Friday October 14, 2016, 7:30 PM, Emam and Friends, Open Secret Bookstore, 923 C St., San Rafael, CA 94901. Info: 415-457-4191. Tix: $20 donation at the door. No one will be turned away for lack of funds! For more information: 415-472-1008. Facebook Event. Poster. Monday, August 1, 3:30 PM, Guttersnipe interviews Matthew Montfort about the Global Guitar Summit on Unfiltered Camels on KZSC, 88.1 FM, 1156 High St., Santa Cruz, CA, 95064. Streams live and archived for 2 weeks after online at www.kzsc.org. Monday, August 1, 4:05 PM, Hala interviews Matthew Montfort about the Global Guitar Summit on KKUP, 91.5 FM, 1275 Franklin Mall, PMB 9150, Santa Clara, CA, 95050. Streams live at kkup.org. Monday, August 1, 9 PM,DJ Sol Max Ion interviews Matthew Montfort about the Global Guitar Summit on KZSU, 90.1 FM, Stanford, CA 94309. Streams live at kzsu.stanford.edu. Due to decades of arts cutbacks, many of the presenters most supportive of world fusion music have suspended operations or are cutting their seasons. For our 37th season, we need your help to replace lost operating income caused by diminished arts support. More info.